I was riding my bike home tonight and found myself on an 8% grade ascent, which made me think of my trip this summer through Tuscany by bike. While it was definitely my favorite part of the trip (at the time I considered it life changing), it's taken me a long time to get to writing about it. 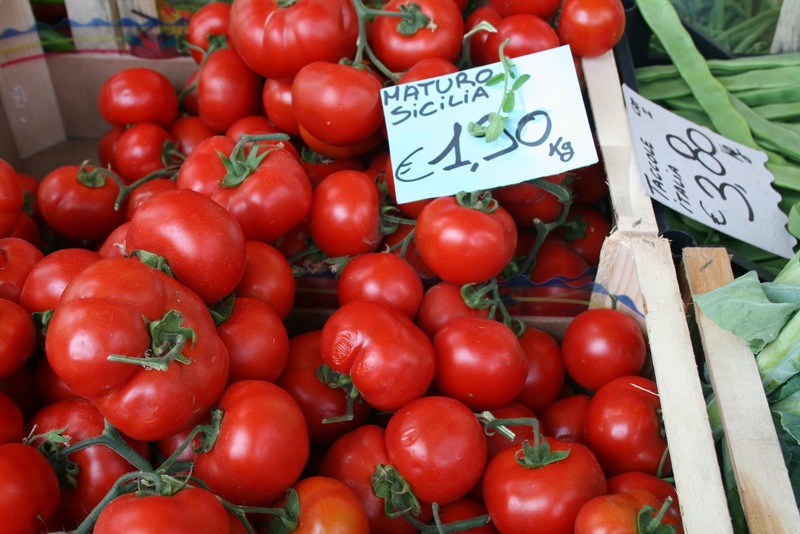 In a way, that's very Italian - do things in what ever amount of time they take, just be true to the effort. 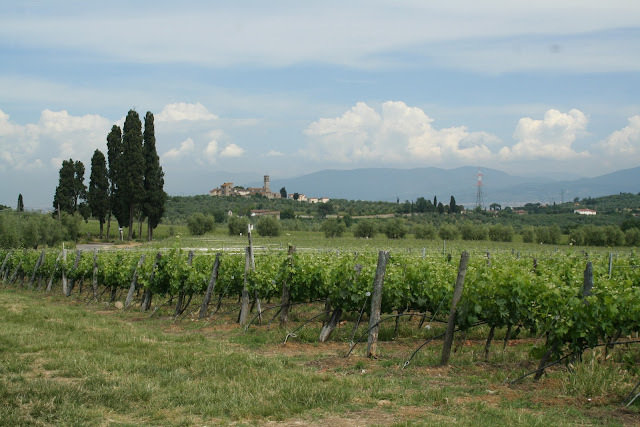 For anyone planning a trip to Europe, I cannot suggest more highly Florencetown bike tours. I can't imagine seeing the countryside any other way. When in a car, passing by the rows of grape vines and olive trees, it's gorgeous, yes, but I get mesmerized by the sites flying past me and fall into a trance (aka, falling asleep). But on a bike, I had to stay present, I had to work for the views, and when I saw them they were that much more stunning. It's no surprise that a place like this was also the birthplace of the Slow Food movement which seeks to raise awareness of the connection between what we eat and the world around us and how eating local, sustainable, well-raised food makes for a better planet and for tastier dishes. One of our wonderful lunches was at a restaurant with slow food stickers all over its window called Ristorante da Padellina. There, we had a wonderful antipasta with meats probably from the village center we'd just ridden by. We also had an assortment of fresh pasta along with a few bottles of wine for the table. 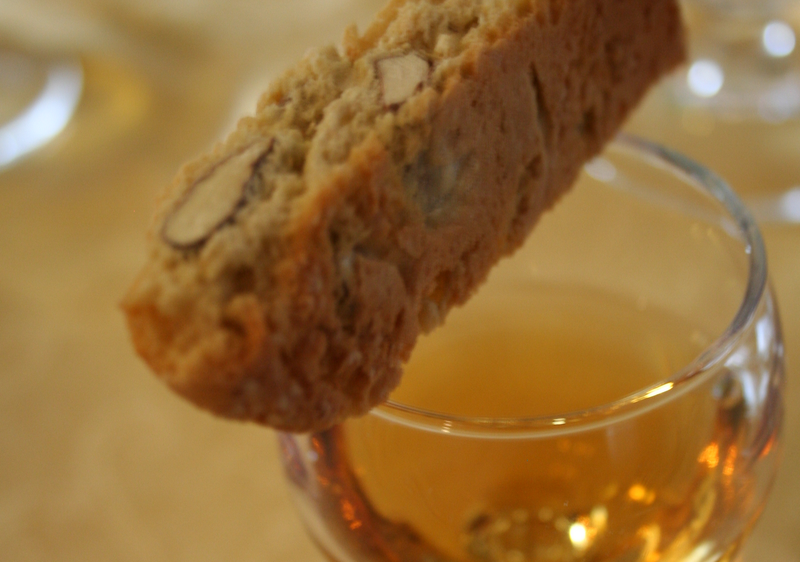 And we ended with the typical glass of Vin Santo (a sweet wine) and biscotti for dipping. One of the places where we stopped prior to our delicious, slow food lunch was in Panzano to see the butcher shop of Dario Cecchini, made famous locally because of his almost religious attentiveness to the full use of an animal ("everything but the moo") and internationally because of his appearance in the book, Heat. 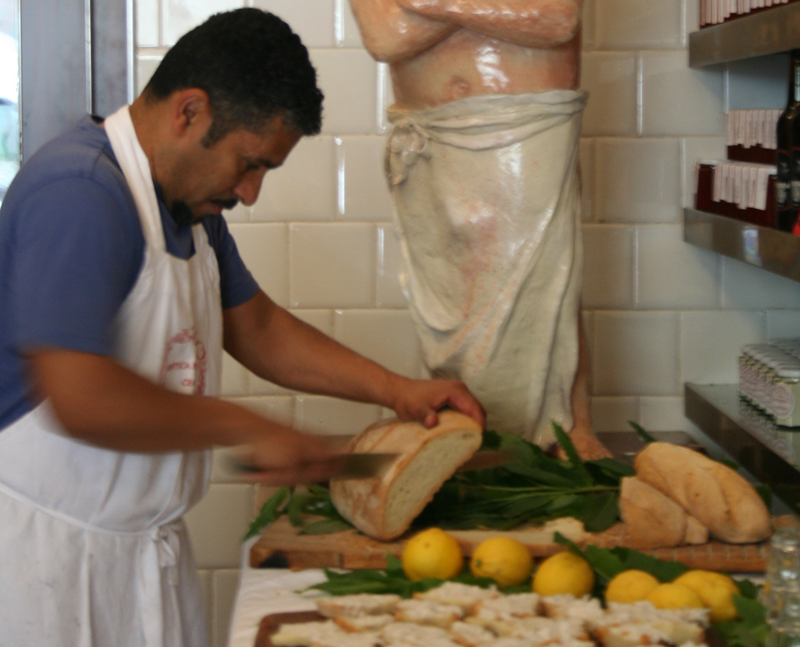 Dario does, indeed, put on a show, and serves up some amazing treats in his shop, such as fresh bread covered in flavored lard (don't knock it till you try it). 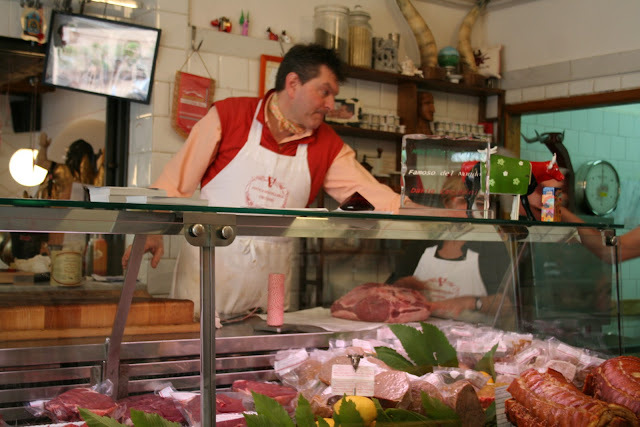 Although Dario is a small hero and may even be a part of the slow food movement, he imports his beef rather than using the local Chianina cattle, the long-legged, white cattle local to the area and historically used in bistecca. They are so local, in fact, that we saw one down the hill from the villa we stayed in. Even our meal at our villa was phenomenal. 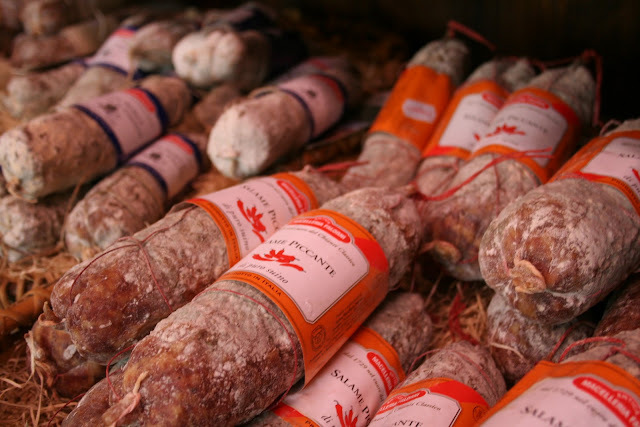 But what I had realized early on in my travels through Italy, were fully confirmed in this adventure - food is better shared with a group of people you really like being with. Friends, family, or people you've been biking with for a day. It doesn't matter. The key is to be with people with whom you have a shared experience, because food like this is meant to be passed around the table and shared. So I learned a lot of things while on my bike through Tuscany. 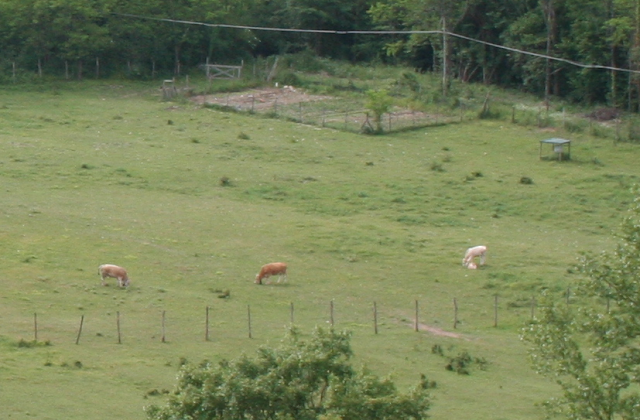 I saw my first Chianina cow. I saw my first laurel tree. I learned how to make extra virgin olive oil and that you should eat it fast because it doesn't last. 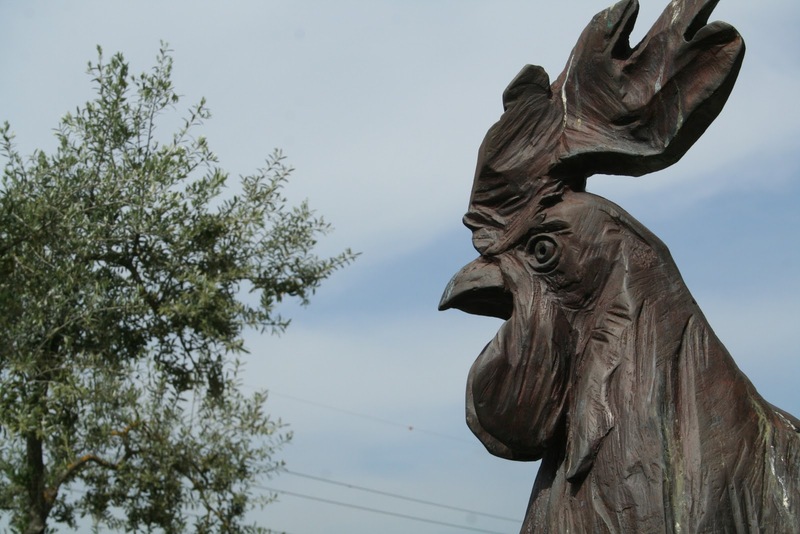 I learned what it means to have the official Chianti rooster on a bottle of wine. But the most important thing I learned was to take it slow, enjoy the ride, and share it all with great friends (old and new). Buon appetito. oooh nice, tuscany is now on the list!